"To be truly, in every way, a local incarnation and sign of the Holy, Catholic, and Apostolic Church in union with the Vicar of Christ, the Hierarchy, and the holy Magisterium with all the richness and beauty of Catholic Truth, Liturgy, and Tradition in our day." Call us or email Father to find out how to get one. In February Our Rector was made a Canon of the Military and Hospitaller Order of St. Lazarus of Jerusalem - A great honor. Saturday: 4 p.m. Rosary is recited at 3:30 p.m.
Monday-Friday except most Thursdays at 8 a.m. (followed by the Rosary). Thursday: 6:00 p.m. followed by Benediction (Call for possible schedule changes). Rosary at 5:30 PM (most weeks). Gregorian (Tridentine) Mass at 6 p.m.
Special Feasts: Low Mass at 8:00 a.m.
Saturday: 3:15 p.m; after daily Mass and Rosary; or by appointment. SPIRITUAL DIRECTION OR GUIDANCE: Please feel free to call Fr. Pérez to make an appointment in this regard. Many problems that individuals and families face can be helped by looking into our sites and especially the one entitled "MARITAL HEALING", which includes also many, if not all, sexual problems and disciplinary problems of the home. Do visit this site most wealthy in information and guidance for the Catholic person and family! Thursday before First Friday: 7 p.m.
Every Thursday during Lent, after Low Mass. WEDDINGS AND BAPTISMS: MUST BE A FULLY PARTICIPATING PARISHIONER ACTIVE IN EVERY WAY IN THE PARISH. CALL FATHER FOR APPOINTMENT. ALL THE PREREQUISITES OF THE CODE OF CANON LAW REGARDING MARRIAGE MUST BE OBSERVED AS WELL AS ALL REGULATIONS LAID DOWN BY THE VERY REV. PASTOR. by The Very Rev. Héctor R.G. Pérez y Robles, S.T.D., C.S.L.J. Grant we beseech Thee, O Lord, to Thy servant our newly consecrated Bishop, His Excellency William Albert Wack, that by teaching, preaching and doing such things as are right, he may by the example of good works edify the minds of those under his authority, and receive of Thee, most tender Shepherd, an everlasting recompense and reward. May he follow in the footsteps of all the great Pontiffs from of Old and bring the Diocese commended to his pastoral care to greater fidelity to Thee, Thy holy Church and Thy Vicar on earth the Pope, and thus lead us all as a good shepherd on the Path that leads to everlasting Glory. May the Blessed Mother of God, Mary Immaculate, intercede for him each day, and lead him by the hand to be Thy faithful, devoted and loving servant. We ask this, through Our Lord, Jesus Christ, Eternal Shepherd of Souls, who lives and reigns with Thee in the unity of the Holy Spirit, one God, forever and ever. Amen. At present these needs are being met with each individual as best suits his or her needs. Talk to Fr. Pérez if you are interested in becoming a Catholic. We are always in need of new and fresh voices. If you are a music student and need an internship, perhaps we can arrange it in exchange for singing in our choir. Our Organist and Choir Directress, Mrs. Marianne Carlton, Former Dean of the Guild of Organists in Pensacola, and music Professor at Pensacola State College. Come and learn also help us to praise the Lord in the Holy Liturgy. We sing at the Gregorian Masses on Sundays at ten thirty and the Pauline (New Rite) Mass on Saturday at four. Remember, we will be in the Sacred Temple - proper dress required. We practice most Saturdays at 5:10 p.m. and in the Parish Hall on Sundays at 9:15 A.M. Please feel free to join us! Those who need credit hours for a music degree are welcome. We will work with you in attaining your goals. Remember, you don't have to be Caruso or Pavarotti, just praise the Lord with your gift of voice. Many blessings are promised and guaranteed! Here at St. Stephen we are 100% pro-life. Children and babies are most welcome. We prefer that they participate as fully as they can according to their abilities and, of course, some measure of decorum is expected as we educate our children in the richness of our Catholic Tradition. Though there is a cry room in the back of the Church, off the Foyer, we prefer that it is only used in dire cases of babies who are crying extremely loud or children talking out loud. Otherwise, we give praise to God for the little voices who, in their own way, give Him worship and homage by their very existence and being. Children are our future and we love and protect them in every way. We give thanks to God for them and their parents! We ask that you please refrain from giving children any snacks in the Church proper. 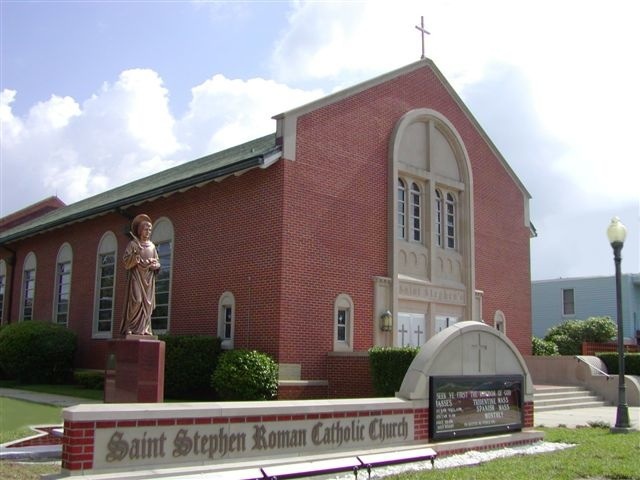 St. Stephen & the Diocese of Pensacola - Tallahassee are committed to healing the hearts of sexual abuse victims and have established Victims Assistance Coordinators who are experienced and trained counselors and are available to help those who may have experienced sexual abuse from any priest, deacon or church personnel. The Victim Assistance Coordinator for the Pensacola area is Dr. Louis M. Makarowski, Ph.D. P.A., His contact number is: (850) 477-7181.